Order by 4/22/2019 at 11:59 PM CST. $45.01 $52.95 As Low As $0.66 ea. Note, just because an item has a higher weight doesn't mean it's thicker. Example: 100 lb. Text stock is actually lighter than 80 lb. Cover stock. Bond stocks are often used for note pads. Text stocks are often used for note pads, Post-It® notes, light-weight note cards, and medium-weight note cards. 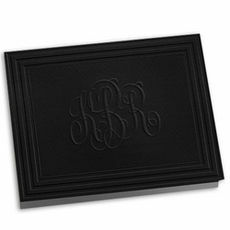 Cover stocks are often used for medium-weight note cards, heavy-weight note cards, holiday cards, business cards and invitations. Board stocks are similar to cover stocks except they are available in much heavier weights. At 60 pt., board stock is extremely rigid and thick, similar to the cover of a harcover book. heavy 120 lb. 15 pt. To compare paper stocks, view the TYPE and the WEIGHT. You can see the lightest weight stocks fall under the BOND column and the heaviest weight stocks fall under the COVER column. So, why isn't 80 lb. Text the same weight as 80 lb. Cover? While the weight in pounds for most paper types is based on the total weight of 500 sheets, the dimensions of each individual sheet may vary for different TYPES of paper stock. For example, Text stock is weighed based upon 25" x 38" sheets, while Cover stock is weighed based upon 20" x 26" sheets. Due to manufacturing differences in paper, not all papers of the same type and weight will feel the same. Set of triple thick flat notes with border color of your choice. Size 6.2" x 4.5". Matching blank envelopes in the stock of your choice. Embossed return address and optional envelope linings available. Typestyle and positioning only as shown. Ordering now but want something immediate for your recipient? Due to the font size chosen and/or the amount of text entered on each line, we have dynamically resized your text to proportionally fit the available imprint area. You must first select a field to enter the special character into. The preview shows approximately what your item will look like. Content will be printed exactly as it appears on this layout*. Please carefully review spelling, typestyle, design and/or color choices. * Minor spacing adjustments may be made at the factory's discretion for best print quality. I accept the preview image and terms. If you continue you may have to reenter your details.